Sen. Marco Rubio, a Republican from Florida, rushed three Sunday news shows to continue his fight against President Barack Obama's decision to normalize relations with Cuba. 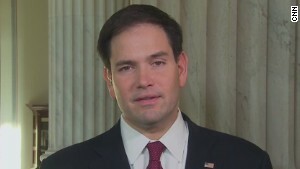 Rubio says is Paul wants to align himself with Obama's foreign policies, "he has a right to do that"
Washington (CNN) -- Sen. Marco Rubio, who is considering a presidential run, said Sunday that President Barack Obama has thrown away valuable leverage to bring about political changes in Cuba. He also took another opportunity to attack his potential opponent for the Republican presidential nomination, Kentucky Sen. Rand Paul, who agrees with Obama's decision to switch course on Cuba. The most vocal Republican leading the fight against Obama's rapprochement with Cuba insisted again that Obama's new policy won't bring democracy to the island. "My opposition to what the President has done is it won't do anything to further that cause (of democratization)," Rubio said on NBC's "Meet the Press." "There has to be some reciprocal opening on their part toward democracy and there was none in this engagement." 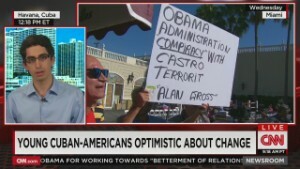 Rubio, who is Cuban-American, also said Cuban democracy activists "feel betrayed" by Obama. "He completely ignored them and threw them to the side in this whole process," Rubio said, adding that he would have "actively and vibrantly engaged" those activists if he were President. And the slugfest between Rubio and Paul continued Sunday. 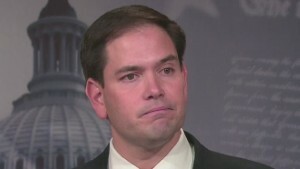 Just days after Rubio said Paul "doesn't know what he's talking about," the Kentucky senator swung back Friday on Fox News calling Rubio's remarks "rude and intemperate" and suggesting Rubio was promoting "a policy of isolationism" toward Cuba that hasn't brought about regime change. Rubio didn't bow out on Sunday, once again aiming his arrows at Paul in a preview of what could come in an eventual Republican presidential primary bout. "Rand Paul, if he wants to align himself and become a supporter of the Obama foreign policy, particularly toward Cuba, that's his right, he has a right to do that," Rubio said on Sunday. 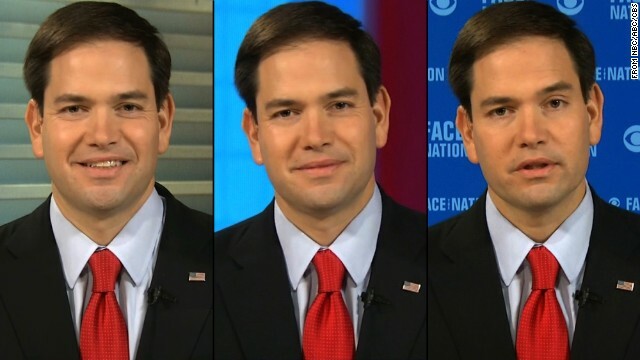 Rubio also accused Paul of becoming the "chief cheerleader of Obama's foreign policy," on ABC's "This Week." That prompted Paul and his senior adviser, Doug Stafford, to fire back.
.@marcorubio forgot to mention his support for Obama's funding of Musl. Brotherhood, arming Islamic rebels, and Hillary's war in Libya. "With all due respect, Sen. Marco Rubio was captain of the GOP cheerleading team for Obama's arming of Syrian rebels, bombing Libya resulting in a jihadist wonderland and illegally giving foreign aid to Egypt's military government. The Rubio-Obama foreign policy has made the Middle East and North Africa less safe," Stafford said in a statement provided to CNN. Rubio has won the support of most of his Republican colleagues in the Senate, with some joining him in attacking the policy shift and others, like incoming Senate Majority Leader Mitch McConnell, deferring to Rubio's expertise on the subject. 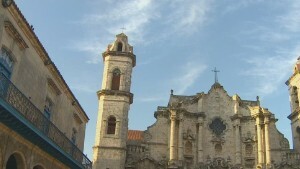 Defenders of Obama's decision to ease sanctions on Cuba and normalize diplomatic relations with the island nation, including Paul, have called the embargo and sanctions on Cuba a 50-year policy that has failed to provoke any political change and have pointed to U.S. decision decades ago to engage and trade with China and Vietnam. Rubio on Sunday looked to spin those examples to his advantage, saying the U.S. should "learn our lessons from those policies," calling China's regime more oppressive than when the U.S. normalized relations with China in the '70s. "Certainly the Chinese economy has grown, but politically they're more repressed than they were twenty or thirty years ago. There's no freedom of religion, no freedom of speech, no free access to the Internet, no elections, no political parties," Rubio said. "So in essence, that is the model the Cubans will try to follow." And while embracing that analogy, Rubio also dismissed a comparison between Cuba and China when prompted about whether he would end the U.S.'s trade relations with China if he became President, noting that there are "geopolitical realities" when it comes to the Asian power. "My interest here is singular, and that is freedom and democracy for the people of Cuba," Rubio said. "I just don't think that this policy that the President has put in place furthers that goal. In fact, I think it makes it harder to achieve." But Rubio may not be the only Florida politican with strong views on the issue entering the 2016 GOP fray of presidential hopefuls. Former Gov. Jeb Bush, who announced this week he is "actively" exploring a presidential run, also slammed Obama this week for rewarding Cuba's dictators, calling it an "ill-advised move." And while Bush has been a mentor to the younger Rubio in many ways, Rubio said a Bush candidacy would not deter him from his own. "Jeb if he runs will be a very credible and formidable candidate," said Rubio, who has not yet made a decision about running. "When you reach a point where you're thinking about running for President -- as I am -- what you have to make your decision on is not on who else is running, it's on whether you think that's the right place for you to achieve your agenda and serve your country."